"A Full Day Of Water Fun! - Rapids! Falls! Slides!" The first themed water park in the world, River Country opened on June 20, 1976, and closed on September 1, 2001. Disney announced its permanent closure in early 2005. It was located within Fort Wilderness on the shore of Bay Lake. Its theme was that of the old fashion swimmin' hole from the days of Tom Sawyer and Huck Finn. The success and popularity of River Country led to the opening of Typhoon Lagoon in 1989 and Blizzard Beach in 1995. River Country was officially opened (June 20, 1976) when Susan Ford (President Gerald R. Ford's daughter) took the first trip down Whoop 'n Holler Hollow. To keep the water in River Country fresh, Imagineers built a giant flexible intake/filter tube which was placed at the mouth of River Country's Bay Cove, opening up into Bay Lake. The tube was filled with water and monitoring equipment to allow it to expand and contract to maintain the water level. The water from Bay Lake would be pumped through this tube to the top of the water slides at a rate of 8,500 gallons per minute. The excess water in River Country would spill out over the "bladder," back into Bay Lake. The bladder was a large rubber wall that separated River Country from Bay Lake. It was inflated 6 inches above the surface of Bay Lake so River Country's water level was higher, allowing gravity to spill the water back into Bay Lake. The rocks surrounding the water slides at River Country use the same design (by Disney rock man Fred Joerger) as the rocks found at Big Thunder, the caves of Tom Sawyer's Island, and Schweitzer Falls of the Jungle Cruise. The rocks at River Country may have been fake, but they were scattered with real pebbles from streambeds in Georgia and the Carolinas. 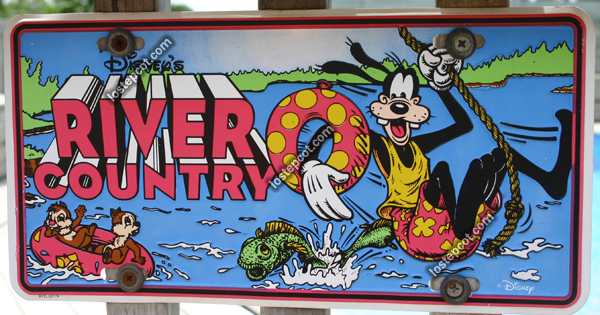 River Country's mascot was Goofy. The Goof would often be seen in his swimsuit going down slides and swinging across the boom. Seen on most of the River Country merchandise, Goofy would also be accompanied by Chip and Dale. In the late '90s, a rumor went around that River Country would receive an alligator mascot to match Lagoonagator (Typhoon Lagoon) and Ice Gator (Blizzard Beach). However, the River Gator never saw any sort of light due to River Country's closing in 2001. 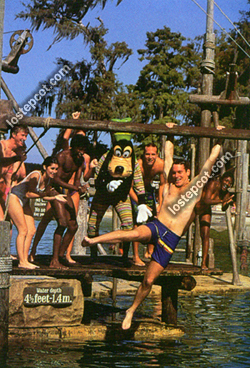 In the '90s, River Country began celebrating its "All-American Water Party" to help boost its popularity. Goofy would make more frequent visits (often arriving by boat or horseback), along with Chip, Dale, Pluto, and Minnie, all dressed in American getups. During the summertime celebration, buttons were handed out. Other fun and games surrounded the celebration, including a banjo band. Everyone went to Typhoon and Blizzard, making River Country unnecessary. The water from Bay Lake was corroding everything. Since its closure, Disney has basically let the area rot. Still visible when traveling by boat on Bay Lake, the bridges and infrastructures seem to be falling apart, allowing the foliage to take over. The future of the site remains a mystery. 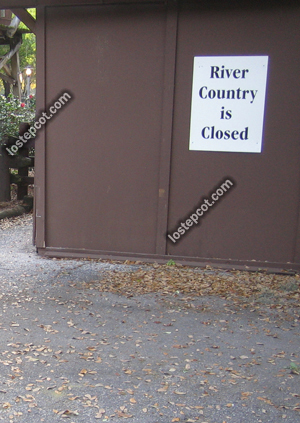 For awhile, one rumor speculated that River Country would became an exclusive pool area for Fort Wilderness guests. Unfortunately, the only thing currently stirring in the area have been the ibises and cranes wondering what happened to all the guests who would drop goodies for them to snack on. Upstream Plunge - This was the oversized, heated, kidney-shaped pool. The back half was buoyed off to make room for the guests plunging down from the drop-off slides. Slippery Slide Falls - These were the twin drop-off slides. The slides began at the top of a rocky peak and ended 7 feet above the water, allowing guests to drop off of the slide into the pool below. 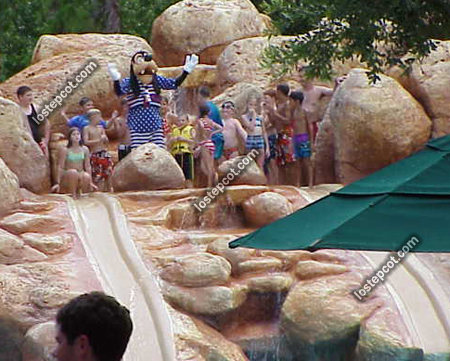 River Country has been the only Disney water park to feature drop-off slides. Kiddie Cove - This was the main area of Kiddie Cove. It had a sand bottom, and it was separated from the main Bay Cove area by the Barrel Bridge. Floating wooden-like alligators were available for kids to float on here. Kiddie Slides - There were four small water slides built into some rocks that surrounded the Kiddie Cove area. Playground and Beach - Surrounding the Cove was a sandy beach situated next to a small playground. Bay Cove - The main swimmin' hole of River Country - it featured a sandy bottom and got its water source from Bay Lake. Beach - The main sandy beach of River Country - it contained beach chairs and was often populated with ibises and cranes. Barrel Bridge - This was one of two ways to access the Bay Cove water slides by foot. It floated on barrels similar to the barrel bridge found at Tom Sawyer's Island. Boom Swing - Located on a tiny island in Bay Cove, guests could hold onto a wooden ship boom, swing out, let go, and plunge into the water. Cable Ride - Found at the same island as the Boom Swing, the Cable Ride had guest holding onto a handle which would slide down a cable. The guest could let go of the handle any time. Tire Swing - Located near the mouth of the Bay was a tire swing that guests could swing on and then dive into the water. Bay Bridge - The second way to access the water slides by foot, Bay Bridge was built on stilts and did not float the way the Barrel Bridge did. It was located at the mouth of Bay Cove which connected to Bay Lake. White Water Rapids - The queue line for this inner-tube ride actually started in the water. Black inner-tubes were the first to be used here, and then later came yellow ones. Unlike the tube rides found at Typhoon Lagoon and Blizzard Beach, White Water Rapids allowed multiple guests to go down the rapids at once. White Water Rapids was also notably rougher than its counterparts at the other two water parks. It went along an area called Raft Rider Ridge next to Whoop 'n Holler Hollow. At the slide's finish, it spilled guests off into Bay Cove, allowing them to relax in their tubes for awhile. Whoop 'n Holler Hollow - Fitting its name nicely, Whoop 'n Holler Hollow was River Country's wildest ride. It contained two body slides that sent guests whipping around fast hairpin turns. It was much rougher than any curving body slide at Typhoon or Blizzard. At its climax, it spilled guests off into Bay Cove, which was around 6 feet deep at that end. Guests would have to swim quite a ways before they could touch the bottom or cling onto a side. If you couldn't swim, it was wise to bypass Whoop 'n Holler Hollow. Indian Springs - This was a small interactive play area for kids, with water squirters. Pop's Willows - This was the main picnic area surrounded by cypress trees, ibises and cranes. Cypress Point Nature Trail - This was a scenic path that went out into a cypress swamp on a wooden boardwalk. Sunken trees and wildlife surrounded the trail. Ticket Hut - Tickets were available at the park entrance in the same building as Guest Relations. Towel Window/Service Building - Locker rentals, towel rentals, first-aid, a penny-press machine, and telephones were located at the Towel Window of the main service building. Dressing rooms, restrooms, were available at the main service building. Pop's Place - Located in the main service building, Pop's Place housed snacks, refreshments, barbeque, fried chicken, baked beans, brownies, and peanut butter and jelly sandwiches. Waterin' Hole - In a smaller building, the Waterin' Hole was another place for snacks, refreshments, and coffee. River Relics - This small shop, located next to the Waterin' Hole, sold River Country merchandise and sundries. Hair Wraps - This was a small area similar to other hair wrap stations that were around Disney World during the late '90s. Cookout Pavilion - Not actually part of River Country, this large pavilion is still in operation under the name of "Mickey's Backyard BBQ." It was also the River Country hurricane shelter.